Producer Darren Goldberg, B.A. ’97, discusses new VH1 original movie premiering Jan. 4. In VH1’s new film “The Breaks,” Nikki Jones has just graduated from George Washington University when she decides to forgo a scholarship to Harvard Law School. Instead, she does something radically different: She moves to New York City to pursue her true dream of working in the hip-hop industry. She’s joined by two of her friends, and the movie follows their journey navigating the music world in the ’90s. 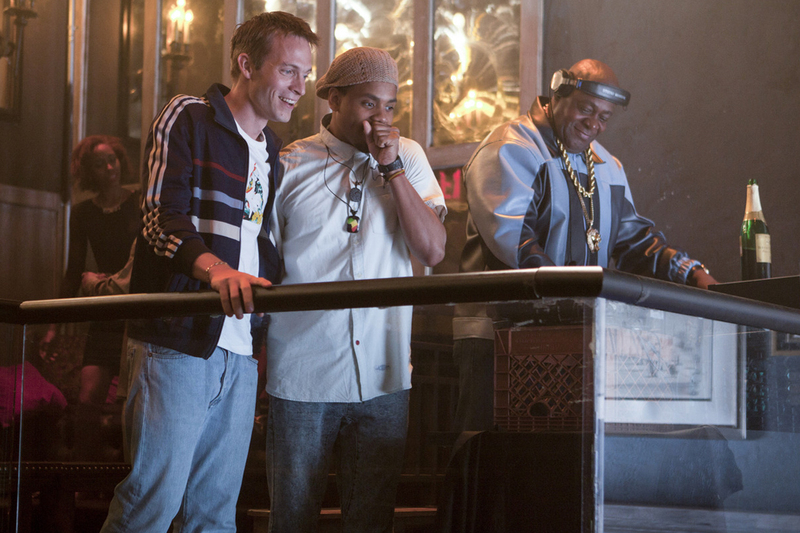 The film drew inspiration from Dan Charnas' book “The Big Payback,” and features cameos from ‘90s hip-hop stars like Method Man and DJ Chuck Chillout. Watching the fictional alumni take on New York isn’t the film’s only GW connection—one of its producers is School of Media and Public Affairs alumnus Darren Goldberg, B.A. ’97. George Washington Today reporter Julyssa Lopez caught up with Mr. Goldberg and heard about what it was like to work on the project, and what scenes might look a little familiar to the GW community. Q: We know this is about young people trying to make it in the ‘90s hip hop industry. Can you tell us more about their journeys? A: It’s a fictional story that chronicles three friends in New York City who are united by their love of hip-hop. All three of them are graduates of the George Washington University. The movie is based off a book called “The Big Payback” by Dan Charnas, and he conducted 300 interviews with hip-pop industry figure and chronicled the industry through the ‘70s, ‘80s and ‘90s. There’s no character that represents one specific person, but the film is inspired by real life accounts. Q: Why was it important to do a film about hip-hop in the ‘90s? A: The ‘90s were a real defining point for hip-hop music—it’s when hip-hop crossed over into the mainstream. We’re at the cusp of a massive change in the music industry when the film starts. In the event that the film goes to series, it’s a ripe period of time to tell stories like this, because of all the changes happening. Q: What are some ways the film embodies the ‘90s? A: It’s really about the music. DJ Premier is the composer and executive music producer, and he is 1990s hip-hop. The soundtrack definitely sets the tone. We have some really interesting cameos, too—Method Man plays the father of one of the main characters, and he plays someone who has zero interest in the hip-hop industry. Chuck Chillout, who was a renowned DJ, plays himself. He’s spinning at a club, and that’s exactly where he would have been in the ‘90s. The Breaks features DJ Chuck Chillout (right). Q: Can you tell us about the connection to GW and the decision to have the main characters graduate from the university? A: When I read the script, I was excited to see the reference to GW. A lot of times, when we read scripts where certain schools or businesses are called out, they’re changed by the time of actual production because of rights and clearances. But I graduated in 1997, and I’ve been an active alumnus, so I quickly reached out to the university to get proper permissions and keep the characters as GW graduates. Q: Are there any scenes GW students might recognize, or see the university in? Q: What are some other things we should know about Nikki and what happens after graduation? A: After graduating from GW, Nikki gets her first break in the industry by talking her way into an internship at a premier hip hop company. Nikki is a flawed hero—she might not go about things in the absolute right way, so a lot of the set up of the film is watching Nikki figure out what she needs to do. Q: As a producer, what was it like to work on this project? A: My production company, Atlantic Pictures, has been making independent films, commercials and branded content in New York for more than 10 years. I was also born and raised in New York City, so my connection here is deep. VH1 came to us with the project because they were looking for a company that understood the city. Every movie we do presents a new challenge, and the biggest challenge in this project was keeping true to the ‘90s. We had to to find the right streets and locations and radio stations. The city looked a lot different in the ‘90s. There was graffiti everywhere, cabs were different. Something we realized in post-production is that all subway signage now says "Metrocard", but there were no Metrocards in 1990. Q: The story seems like it’s about the struggle to achieve your goals. How do you think that will resonate with students? I think that’s what the appeal is going to be to the audience. Whether it’s 1990, or the 2000s, or 2010, when people are coming out of college, they’re all faced with the same thing. They’re thinking, “Hey, we need to make a path for ourselves.” And I think that’s what will resonate.